John Garvey looks at the Deepwater Horizon disaster and the oil industry in general. While the oil “spill” at the Macondo well in the Gulf of Mexico (fifty miles off the Louisiana coast) that began with an explosion and fire on the Deepwater Horizon on April 20th has received a great deal of attention in the regular news media (some of it, by the way, quite serious and critical), it’s necessary to place the explosion and its aftermath in some larger contexts. As many media commentators have already pointed out, the report should best be seen as BP’s initial test-run of its defense against allegations of “gross” negligence as compared to just ordinary regular negligence. Apparently, the cost difference of a legal finding in such a matter is a mere $15 billion. For the moment, I’ll leave it to the courts to sort out the legal issues—without implying that the courts will supply either justice or wisdom. I just have other fish to fry. I do, however, want to suggest that a preoccupation with degrees of negligence amongst the various parties or with the narrowly legal dimensions of the disaster is likely to divert attention from what are, ultimately, much more serious matters. Disasters certainly have their attractions. Who hasn’t wanted to watch a fire down the street? But we usually prefer that they don’t last as long as this one. The best ones last only as long as a feature movie. You know the script–the day starts out as usual (coffee and a kiss good-bye); something odd happens; no one really notices; the odd things keep coming; all hell breaks loose; an odd couple, thrown together through even odder coincidences, realizes what’s happening; they know something that no one else knows; they frantically try to notify the authorities; the authorities are in denial or campaigning for re-election; the wife or child of one of the authorities gets caught in some of the bad stuff; the authorities eventually take notice; they recognize the odd-ball wisdom of the oddly associated couple; they agree to do what seems impossible; the first try doesn’t work; the even odder scientist recommends an adjustment; it’s done and the town/city/nation/world is saved. Whew! All in just less than two hours! (Let me confess—I like those movies as much as anyone. I also like a lot of other bad movies and some good movies). But this is no movie. The prolonged flood of oil into the Gulf of Mexico, over the better part of four months, and the yet to be properly accounted for, long-term impact on the natural environment and the well-being of residents in the coastal communities suggest that we need to lengthen our attention spans a bit. The disaster should attract the deep attention of Americans, and especially American workers, to the devastation that is the result of oil (and by extension, gas and coal) production across the globe. What’s at stake is something much bigger than the possibility of our next vacation on the shores of the Gulf of Mexico. The Gulf disaster is a window into seeing how oil and other forms of energy production have devastated all too many natural environments and ruined the lives of all too many people across the planet. If we concentrate too much on surface appearances or are relieved by a too-soon happy ending, we become susceptible to: 1) the false assurances of advertising (which BP, with its cute yellow and green logo, has been exceedingly generous in funding—so much so that it may be responsible for the New York Times showing a profit this year); 2) news reports paid indirectly through advertising, and 3) somewhat paradoxically, the lures of a variety of conspiracy-oriented explanations of what lies beneath the surface. It is essential that we acquire sufficient understandings of scientific/technical issues in order to adequately assess what has happened and what its consequences might be. This essay is the product of an effort in self-education on some of those matters. I welcome all corrections of facts and flawed interpretations. Simultaneously, we need to imagine ways in which the remarkable scientific/technical expertise that is primarily deployed for the purpose of production for production’s sake (in this case of oil, but, more generally, of just about everything that’s bought and sold) might be re-appropriated for the long-term reduction of unnecessary labor and the comprehensive production, preservation and thoughtful use of non-human resources. This imagination would, I think, be greatly enhanced by a new appreciation for the ways in which Karl Marx’s critique of political economy was informed by a delicate and sophisticated interpretation of the relationship between humans and nature as well as his prescient understanding of the terrible costs of the squandering of human lives, the products of human labor and nature’s treasures in societies dominated by capital. Eleven men died on the Deepwater Horizon. They appear to have come from a rich cross-section of the population of the states bordering the Gulf.2 Even now, their names are probably not well known outside their families and the communities they lived in. In this miserable year of 2010, they joined the 29 coal miners killed in the Upper Big Branch disaster in Montcoal, West Virginia and the seven Chinese coal miners who are reported to die every day of the year and still others elsewhere in the count of victims sacrificed in the energy industry and the many thousands unnecessarily lost in the Haitian earthquake at the beginning of the year and the recent floods in Pakistan as a result of the inadequacy of the physical infra-structures in those lands. This essay will not likely be read by any of the family members or friends of the eleven who died and it can hardly claim to serve as much of a memorial to their too short lives. But their deaths must not be forgotten. We are long overdue for a renewed commitment to the elemental affirmation of solidarity that “An injury to one is an injury to all.” Solidarity, however, cannot end at a workplace, a company, an industry or a border. When we embrace those who died in the Gulf, we must embrace all those many un-named others who have died and are dying, slowly or suddenly, all over the world. Furthermore, solidarity should not be seen as its own ultimate self-justification. Solidarity in the face of a social system that continues to produce maimed and dead workers cannot be content with shared anger at the pain and suffering. It needs to be complemented by a vision that points to a world where such casualties are not assumed to be all but inevitable. We need a solidarity that is deeply influenced by and respectful of the traditions of the last two centuries of workers’ struggles but, at the same time, is inspired by the practical need to abolish the conditions that gave rise to such solidarity in the first place. Ultimately, we need solidarity for what we want and not just solidarity against what we are damaged by. Most Americans who took geography in middle school and social studies in high school know that the Gulf of Mexico is the third great shoreline of the United States—along with the Atlantic and Pacific coasts (let’s leave out Alaska for now). The US coast that stretches from the Florida Keys north to the Florida Panhandle, then west along Alabama, Mississippi and Louisiana and finally south along Texas (until it meets the Mexican border) totals almost 1700 miles. The Mexican coast, which curves like a semi-circle towards Cuba, adds almost 1400 miles. The Gulf’s southern boundary is formed by the island of Cuba. Thirty four American rivers (including the Mississippi and Rio Grande) eventually drain into the Gulf; a number of Mexican rivers (including the Grijalva and Usumacinta) do as well. Water flows back and forth from the Gulf and the Atlantic Ocean through two relatively narrow bodies of water—the Florida Straits and the Yucatan Channel. All told, the Gulf includes approximately 615,000 square miles and 660 quadrillion gallons of water, although the water is shallow along the coast lines–leading to a large number of barrier islands and marshes—as in the Mississippi Delta. (As we’ll see below, that’s a lot of water to use to hide some oil. But hiding is not disappearing). The Mississippi Delta is one of a handful of similar environs in the world—along with the Niger, Mekong, Nile and others not as well known. Deltas are complex mixes of land and water that seem to have something of the character and shape of tangled knitting yarn or the apparently haphazard structure of an uncut forest. It’s easy to imagine that, in an unspoiled delta, someone unfamiliar with the local territory would be lost in no time at all. That complex environment serves the purpose of holding the deltas together so that they can, in turn, serve as the productive breeding grounds of a remarkably diverse array of plants and fishes. They are simultaneously fragile and strong. What Have They Done to the Gulf? As a result of the drainage from the Midwest heartland, it’s reported that 1.5 million tons of nitrogen are dumped into the Gulf every year. The nitrogen dumping results in the accelerated growth of phytoplankton (microscopic single-celled plants which live near the surface of the water because they need sunlight). They, like all of us, die and fall to the bottom. Then they are digested by bacteria (maybe the same ones that are digesting the dispersed oil) which consume lots of oxygen. When there is less oxygen, there is less support for marine life. As a result of this on-going deluge, a dead zone (technically, a hypoxic zone) has spread across the Gulf from Galveston in Texas to Venice in Louisiana. The dead zone now consumes 8,000 square miles—a sea area as big as Lake Ontario—one of the Great Lakes. It’s the second biggest dead zone in the world’s waters; the biggest one is in the Baltic Sea in northern Europe. Let’s take a detour to what has been and is being promoted as an alternative energy strategy—the conversion of corn to ethanol. Ethanol now composes 10% of gasoline at many pumps. Sounds good—grow corn under God’s sunlight and turn it into fuel. God would be pleased—if he was given a proper briefing about the matter. Unfortunately, things are not as simple as God would like. Any increase in corn production results in an increase in the increased use of fertilizers. An increase in the use of fertilizers produces an increase in nitrogen drainage—which increases the size of the dead zone in the Gulf of Mexico. But that’s not all. One report I read said that there were 10,000 miles of oil canals through the marshes of the Mississippi Delta. It’s bad enough that the construction of the canals destroyed marsh land but the resulting straight-line channels allow saltwater from the Gulf to flow into the marshes thereby allowing the saltwater to poison the plant life in the marshes. It may be that some of what’s now wrong is the result of what appeared to be right. The Mississippi River used to flood every few years. People who lived along the river understandably enough wanted to figure out a way to avoid being flooded–so they built a massive system of levees to keep the river at bay. And, in spite of the massive failure of the levees in New Orleans five years ago, the system mostly prevents flooding. But, at the same time, it prevents the deposit of soil sediment carried down the river which leads to the disintegration of the marshes. The soil which would have sustained the marshes is, instead, dumped directly into the Gulf. Since 1932, Louisiana has lost approximately 1,900 square miles of land mass–almost equal to the state of Delaware. And what’s left after oil exploration and production? There are more than 27,000 abandoned oil wells (out of about 50,000 that were ever drilled) and more than 1,000 unused production platforms in the Gulf. Approximately 3,500 of the abandoned wells have been considered temporary cases and have never been permanently sealed. But some of the temporarily abandoned wells have been abandoned since the 1950s. (Just recently, the US Interior Department ordered that those temporarily abandoned wells be permanently sealed). ….since the 1950s, decades of greed and deregulation have turned the Gulf into the United States’ largest industrial wasteland. The Gulf is an immense, watery mausoleum to the hedonistic high times of the military-industrial petro-era. If a gigantic hand emptied the Gulf like a basin of water, we would see a drowned version of industrial New Jersey: seeping oil-rigs, dumped military ordinance, unexploded bombs, thousands of miles of pipelines, a giant watery wrecking-yard, cluttered with the debris of a century of industrial waste. Miles from anywhere, the spires of an oil rig rise from the marshes, like a church to a demonic god. Perhaps the only good thing that can be said about the recent spill is that it has brought to the surface some of the long-term degradation that has occurred in the Gulf. One of the reasons why it might be so hard to understand the magnitude of the petroleum industry is that an awful lot of the oil industry is rather invisible to those of us who don’t live near where it’s produced or refined (and where its ravages are most evident). Peter Maass, in Crude World, comments that: “In a technological sleight of hand, oil can be extracted from the deserts of Arabia, processed to eliminate water and natural gas, sent through pipelines to a terminal on the gulf, loaded onto a supertanker and shipped to a port thousands of miles away, then run through a refinery and poured into a tanker truck that delivers it to a suburban gas station, where it is pumped into an SUV—all without anyone actually glimpsing the stuff” (p. 14-15). Oil production is profoundly dependent on a combination of complex machines and sophisticated technology. It is not nearly as dependent on actual workers. By way of illustration, in Saudi Arabia (the country with the largest proven reserves and the current leader in oil output), out of a population of 20 million, only 50,000 work in the oil industry and there are typically only 500 new hires per year. The oil workforce includes many foreigners and they, along with their Saudi counterparts, live in separate compounds that look more like American suburbs than the Arabian desert—in recognition of this somewhat bizarre reality, they call themselves Aramcons. In the Gulf of Mexico, the off shore oil industry employs about 150,000 people although most of them are not out on the water—in large part, because drilling and production don’t really require much human labor. At the time of the Deepwater Horizon explosion, there were only 126 people on the rig, most of whom worked for Transocean. According to petroleum industry reports from Market Research, in the United States, there are about 5,000 exploration and production companies with annual revenues of approximately $250 billion; 150 refineries operated by about 90 companies with annual revenues of $700 billion, and 5,700 wholesale distribution companies with annual revenues of $750 billion. But the wealth and power of the US-based industry is not reflected in its control of the raw resource. North American oil companies only control approximately 3.5% of producible oil equivalent (oil and natural gas) reserves. In April 2010, world production of all liquid fuels was 86.62 million barrels a day but, perhaps surprisingly, offshore deepwater production was only just over 5 million barrels a day—about 6% of global oil production. However, offshore production is expected to be 40% of world production by the end of this decade—as they drill deeper and farther off shore. Off shore drilling is now underway in countries across the globe (including Brazil, Great Britain, Norway, Tunisia, Egypt, India, Indonesia and Vietnam). In the US, offshore drilling is concentrated in the western and central Gulf (it is prohibited off the Florida coast) and, in a very limited way, off California; 90% of the production comes from the Gulf. In 2009, Gulf oil production was 1.6 million barrels per day—or 31% of all domestic oil production; natural gas production was 11% of all domestic gas production. Off shore drilling takes place in two quite different marine environments—shallow and deep water. Immediately offshore, the water is relatively shallow (less than 700 feet); however, it eventually drops off fairly dramatically to a depth of as much as three miles—so the deepwater wells are also the ones farthest from land. For thirty years, the drilling took place in shallow waters but the development of new drilling technologies launched the era of deep water drilling in 1979. Deepwater oil production surpassed shallow water production in 2001. In 2009, 80% of offshore oil production and 45% of natural gas production came from deepwater. States have jurisdiction over oil drilling that takes place within three and a half miles of their shorelines but, for curious reasons (having to do in part with the fact that Texas was admitted to the Union as an independent nation), Texas and Florida control access for more than ten miles from their shores. The United States claims the right to all resources within 200 miles of its coast and the federal government controls oil exploration by selling leases through a bidding process. (There’s a finely worded agreement that splits the difference in the Gulf in those areas that could be claimed by both Mexico and the US). In 2009, the federal government earned at least $6 billion (and maybe as much as $10 billion) from offshore oil leases; since 1953, the government has collected $200 billion in various kinds of payments. Over the past 45 years, 17.5 billion barrels of oil have been produced from off shore wells across the globe, but only just over a half million barrels have been spilled—30.3 barrels per 1 million barrels produced. And all but two of the largest marine spills of petroleum occurred at the ocean surface—as the result of war sabotage and tanker accidents. Only one serious spill previously took place in the Gulf—the Ixtoc I spill in June of 1979 on a well being drilled for Petroleos Mexicanos (PEMEX) by Transocean. (This summary of spills is based on the expert testimony of Ted Patzek, Professor and Chair of the Petroleum and Geosystems Engineering Department at the University of Texas in Austin before the Energy and Environment Subcommittee of the Energy and Commerce Committee of the House of Representatives on June 9th. So far as I can tell, Patzek is quite critical of many of the industry’s practices and I don’t think he was trying to make things look good. Perhaps I am wrong). Lest I be misunderstood, these facts, regarding the relatively small number of “spills,” obscure something of terrible importance—the most significant devastation of the seas and lands where oil drilling occurs is not from the infrequent spectacular disaster but rather from the routine, day in/day out operations of the industry. The small number of “spills” is in spite of the fact that drilling has been fairly intense. More than 50,000 wells have been drilled in federal waters since 1947. A total of 331 wells were drilled in federal waters of the Gulf in 2009. The Gulf has 7,000 active leases; 64% are in deepwater (greater than 1,000 feet). But, in March of this year, there were only 25 wells in deep water, as compared to over 3500 in depths less than 1,000 feet. Nearly 4,000 wells have been drilled in depths greater than 1,000 feet and 700 in depths greater than 5,000 feet. This suggests a very low rate of finding oil. One source suggested that two-thirds of all drilled wells were never put into production because of a finding that there was not enough oil to make it profitable. (See Caesar below). Exploration, production and transportation are conducted with an extraordinarily complex array of equipment and machinery. One of the hallmarks of the industry’s leaders is a more or less endless race to build bigger, drill deeper and claim world records along the way. It’s not yet clear if BP will claim the record for the biggest spill. Some of the nature of this strange state of affairs is reflected in the names given to the projects and drill sites in the Gulf—including Atlantis, Mad Dog, Thunder Horse (previously Crazy Horse), and Blind Faith. In 1996, Royal Dutch Shell installed Bullwinkle, all 1,736 feet of it, standing in 1,350 feet of water, in the Gulf. Bullwinkle was taller than what was then the world’s tallest building, Chicago’s Sears Tower, but only 262 feet was above the water. The newest drills, even newer than the Deepwater Horizon, are being designed to operate in 12,000 feet of water and to drill 40,000 feet below the sea floor. Their size matches their reach. By way of example, Transocean’s new Discoverer Clear Leader is classified as a 6th generation deepwater rig—part of what the company calls its ultra-deepwater fleet. It was built in Okpo, South Korea in 2009. It has a length of 835 feet and a breadth of 125 feet. Its derrick is 225 feet tall with an 80 foot base. It can house up to 200 workers. Perdido is designed to pump oil from 35 wells stretched across 30 miles. The rig is lighter than others because the process that separates the oil from water, grease and various heavy metals takes place on the sea floor, instead of on the rig, and the oil is pumped directly into a pipeline system that leads to an on-shore refinery. Another example of the invisibility of oil production! In case you were wondering, all of the equipment in deep water is installed, maintained and repaired by remote controlled submersibles—controlled by people at computer terminals on the rig or on land. Human beings cannot work at the depths of the wells. In most cases, oil rigs are not owned by the exploration companies; instead they’re leased from companies like Transocean. In the case of the Deepwater Horizon, the rig was leased to a BP-led consortium that also included Texas-based Anadarko and a wholly owned US subsidiary of Mitsui in Japan. A tangled web indeed! I haven’t mentioned it yet but there is something else that almost everyone knows about the Gulf of Mexico—it has hurricanes. Not surprisingly, hurricanes pose a serious threat to the drilling structures. In 2005, hundreds of platforms and pipelines were destroyed by hurricanes Rita and Katrina. A 2008 CDC (Center for Disease Control) report said that the overall fatality rate for workers in the oil and gas extraction industry was “approximately seven times the rate for all workers” between 2003 and 2006, with many deaths caused by accidents involving machinery and pipes. The Minerals Management Service reported that there had been 1,298 accidents on rigs and platforms between 2006 and 2009—as well as 30 deaths. Before we leave the Gulf oil scene, let’s note three important realities. First, according to one insider report, oil companies stopped investing in staff and in oil drilling technologies during various down periods in oil process. As a result, they rely on multiple contractors (such as Transocean and Halliburton) to provide the technical expertise that they lack. This, according to many reports in the aftermath of the Deepwater Horizon explosion, results in a situation where no one is in charge and no one is responsible (more about that topic below). Second, the increasing computerization of the oil exploration and production processes in the deepwater environment has shifted the responsibility for decisions away from people on the ground (I meant to say water) who might have genuine knowledge about local conditions to people reading data produced by software, written by still other people with little knowledge of the actual geology or physics of the sea floor. Third, the expansion of offshore oil production was prompted, not surprisingly, by high oil prices. But the construction of the offshore rigs and the exploratory work takes time and money and, once again not so surprisingly, the timing is not always right—just when the well is ready to start producing, the price of oil could drop. What’s a poor oil company to do? Most of the time, it will keep on producing. Since time is money, when you want to make more money, you want to spend less time–which is what BP wanted to do in April of 2010! BP apparently finances the companies, like Transocean, that then do the drilling work—meaning that those drilling companies are beholden to the big oil companies for their ability to build and operate the rigs. BP was not planning to start production from the Macondo well any time soon. It had apparently confirmed that there was lots of oil and was going to cap the well and hold it in reserve for connection to its pipeline system sometime in the future. The rush to complete was, therefore, not exactly a rush to produce. (We should not, however, assume that it will never return to the source). Gas from the blowout was sucked into the rig’s diesel engines, which caused at least two explosions and a horrifying fire, which was visible from 145 miles away. Although I believe that this has been reported previously and many readers may know about it, the surviving workers were kept on a nearby service boat and were forbidden to use phones or radios. They didn’t arrive on land until twenty-eight hours after they were pulled out of the water. Then they were “strongly encouraged” to sign a document which reads: “I was not a witness to the incident requiring the evacuation and have no first-hand or personal knowledge regarding the incident. I was not injured as a result of the incident or evacuation (quoted in Caesar).” Apparently even those individuals who were in the hospital were encouraged to sign. 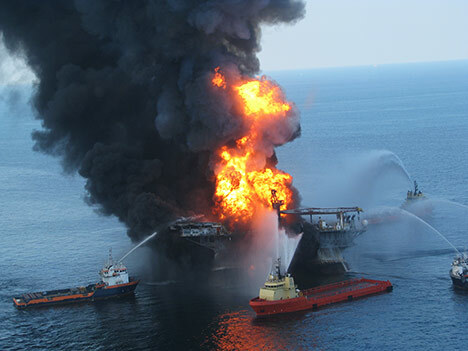 It appears clear that BP was not prepared for the technical consequences of a blowout, the human consequences of an explosion or the environmental consequences of a massive spill (see below) but it was very well prepared for the financial, legal and public relations consequences of all of the above. This heart-breaking story invites a question—a big one: Why did workers who knew that so much was wrong and that they were in great danger keep going back to work? I’ll return to that in the last section. 4.Covering up as much as possible. The least objectionable of the cleanup activities were the skimming and burning. In those cases, the oil being collected or burned off was no longer in the water. On the other hand, the use of dispersants could very well turn out to the making of a prolonged assault against the environment and all its inhabitants. BP sprayed enormous quantities (at least 1.8 million gallons) of what many consider to be poisonous dispersants (Corexit 9500 and 9527). Initially, the spraying was done fairly far off shore by plane but there are now reports from Mississippi that in August, BP furtively deployed private contractors in small boats, specifically contractors from out-of-state that were not involved in the very public containment boom effort, named the Vessels of Opportunity (VOO) program, to spray close to the land. Indeed, it appears that local residents working on the cleanup were being used to find oil that was then sprayed, rather than to skim that oil.6 This suggests that BP, with the close cooperation and support of the Coast Guard, was doing everything possible to make things look far better than they really were. It seems clear that cleaning up the spill was never quite the goal. That goal might better be described as clearing up the spill—in other words, making it go away, even if it didn’t really go away–for both short-term publicity purposes and long-term legal ones. According to a New York Times editorial on September 20th, the National Oceanic and Atmospheric Administration appeared ready to concede that its earlier estimate might have been premature and announced that it would conduct a new systematic study to measure the oil and to assess its impact. It would, of course, be better by far if the damage turns out to be less rather than more but such a result should not provide any reassurance that this spill was not one more very serious assault against the Gulf. Indeed, even as I finished this essay, I came across a TV report from Louisiana that many thousands of dead fish had been found in Bayou Chaland in Plaquemines Parish. In all likelihood, the oil spill will slowly disappear from the news reports but its left-overs will not disappear from the Gulf. Although Ed Caesar’s article from the Sunday Times that I referred to above is very informative, at the end it comes up short on at least one important matter. He argues that the oil spill was “completely avoidable.” By that he means that it is evident that careless maintenance of equipment, cutting corners on various recommended steps to ensure the integrity of the well and ignoring the advice of people who knew what was going on—in a volatile marine and geological environment–all came together to result in a disaster. At one level, of course, he’s right–this disaster could have been avoided. But, and this is a big but, the accumulation of disasters is part and parcel of the contemporary world scene. One or another accident might be avoided but the logic that produces disasters is inescapable. The massacres here are unplanned only in the sense that no date was set in advance, or orders given to shoot. In this sense disasters are different from wars. Yet the possibility of catastrophe is planned for whenever unnecessary risks are taken in the planning of new buildings, industrial processes or machines, or when environmental or biological processes are left to take their course without intervention that could prevent them or minimize their impact. Disasters come in different forms. There are slow-motion disasters, an accumulation of deaths in ones and twos that add up to mass carnage. …. Then there are sudden accidents resulting in mass casualties caused by technical failures of machines or buildings, such as train or plane crashes. Finally there are natural disasters featuring environmental factors such as floods and droughts, but often with social causes. Although the emphasis in the lines above was on disasters resulting in human deaths, I believe the analysis is easily enough re-worked to make sense of the oil spill. It was a sudden accident that took place in the context of a slow motion disaster that resulted in human deaths and a likely environmental disaster. To the extent that the oil spill in the Gulf is followed, more or less rapidly, by a return to production as usual, it is all but certain that the slow death of the Gulf will proceed on schedule—unless and until there’s another accident which becomes a disaster. The labor process, as we have just presented it in its simple and abstract elements, is purposeful activity aimed at the production of use values. It is an appropriation of what exists in nature for the requirements of man. It is the universal condition for the metabolic interaction [Stoffwechsel] between man and nature, the everlasting nature-imposed condition of human existence, and it is therefore independent of every form of that existence, or rather it is common to all forms of society in which human beings live (Volume I, 290). … the product is the property of the capitalist and not that of the worker, its immediate producer. Suppose that a capitalist pays for a day’s worth of labour-power; then the right to use that power for a day belongs to him, just as much as the right to use any other commodity, such as a horse he had hired for a day. The use of a commodity belongs to its purchaser, and the seller of labour-power, by giving his labour, does no more, in reality than part with the use-value he has sold. From the instant he steps into the workshop, the use-value of his labour-power, and therefore also its use, which is labour, belongs to the capitalist. By the purchase of labour-power, the capitalist incorporates labour, as a living agent of fermentation, into the lifeless constituents of the product, which also belongs to him. From his point of view, the labour process is nothing more than the consumption of the commodity purchased, i.e. of labour-power; but he can consume this labour-power only by adding the means of production to it. The labour process is a process between things that the capitalist has purchased, things which belong to him. Thus the product of this process belongs to him just as much as the wine which is the product of fermentation going on in his cellar (291-292). Marx had previously explained that the means of production included the instruments of labor (tools and machines) and the objects of labor (materials either spontaneously provided by nature or natural materials processed through previous labor). He wrote: “An instrument of labour is a thing, or complex of things, which the worker interposes between himself and the object of his labour and which serves as a conductor, directing his activity onto that object. He makes use of the mechanical, physical and chemical properties of some substances in order to set them to work on other substances as instruments of his power, and in accordance with his purposes” (285). A spider conducts operations which resemble those of the weaver, and a bee would put many a human architect to shame by the construction of its honeycomb cells. But what distinguishes the worst architect from the best of the bees is that the architect builds the cell in his mind before he constructs it in wax. At the end of every labour process, a result emerges which had already been conceived by the worker at the beginning, hence already existed ideally. Man not only effects a change of form in the materials of nature; he also realizes [verwirklicht] his own purpose in those materials. And this is a purpose he is conscious of, it determines the mode of his activity with the rigidity of a law, and he must subordinate his will to it. This subordination is no mere momentary act. Apart from the exertion of the working organs, a purposeful will is required for the entire duration of the work. This means close attention. The less he is attracted by the nature of the work and the way in which it has to be accomplished, and the less, therefore, he enjoys it as the free play of his own physical and mental powers, the closer his attention is forced to be (284). In a few sentences, we have gone from the wonder of an architect’s imagination to the need to pay close attention to something you hate to do. The move is from the possibilities of free creation to the realities of wage slavery. … the exchange of commodities breaks through all of the individual and local limitations of the direct exchange of products, and develops the metabolic process of human labour. On the other hand, there develops a whole network of social connections of natural origin, entirely beyond the control of the human agents (207). …large landed property reduces the agricultural population to an ever decreasing minimum and confronts it with an ever growing industrial population crammed together in large towns; in this way it produces conditions that provoke an irreparable rift in the interdependent process of social metabolism, a metabolism prescribed by the natural laws of life itself. The result of this is a squandering of the vitality of the soil, which is carried by trade far beyond the bounds of a single country (949). Man lives from nature, i.e., nature is his body, and he must maintain a continuing dialogue with it if he is not to die. To say that man’s physical and mental life is linked to nature simply means that nature is linked to itself, for man is part of nature. With the exception of the extractive industries, such as mining, hunting, fishing (and agriculture, but only in so far as it starts by breaking up virgin soil), where the material for labour is provided directly by nature, all branches of industry deal with raw material, i.e., an object of labour which has already been filtered through labour, which is itself already a product of labour. An example is seed in agriculture. Animals and plants which are accustomed to consider as products of nature, may be, in their present form, not only products of, say, last year’s labour but the result of a gradual transformation continued through many generations under human control, and through the agency of human labour (Volume I, 287-288). Thus, while society is in nature, nature is also in society. From the standpoint of a higher socio-economic formation, the private property of particular individuals will appear just as absurd as the private property of one man in other men. Even an entire society, a nation, or all simultaneously existing societies taken together, are not the owners of the earth. They are simply its possessors, its beneficiaries, and have to bequeath it in an improved state to succeeding generations, as boni patres familias [good heads of the household] (Volume III, 911). The advances made possible through the application of science and technology have brought us to the brink. As was first suggested more than a hundred years ago, the choice is between socialism and barbarism. The Gulf disaster, and the on-going disasters elsewhere, hint at how the barbaric alternative will announce itself. We remain in need of some new examples for how the socialist alternative might be advanced instead. And we need them sooner rather than later. Although capitalism is obviously characterized by the accumulation of extraordinary wealth by a relative handful, that is not the essence of the beast. The fact of the matter is that the majority of shares in BP might very well be held on behalf of the pensions of millions of English workers—who wouldn’t want to hurt a feather on the wing of a pelican in the Gulf, let alone make life miserable for the people who live around the Gulf. But capitalism goes on just the same—no matter if the owner is a Rockefeller with a top hat (or more currently, a Bill Gates or Warren Buffet with their humanitarian commitments) or many un-named millions of workers, turned into unwitting accomplices in the reproduction of their own misery. What people are willing to put up with depends on circumstances. In the US, almost forty years of a slow wearing down of wages, benefits and working conditions have increasingly resulted in workers being willing to put up with almost anything—even the possibility or likelihood of death. When Jason Anderson and his wife re-wrote their wills, they weren’t doing something very different from what many millions of people in this country do every day—they hope for the best while they prepare for the worst. I don’t think that we’re going to convince very many workers, even those who are going out to rigs as dangerous as the Deepwater Horizon, that they should change their minds. In general, we don’t change our minds because someone convinces us that we’re wrong. The fact of the matter is that most of us are never wrong! Instead, we change our minds when the worlds we live in change. But it doesn’t happen automatically. The world of the people who live around the Gulf of Mexico has changed (probably for a long time). What they make of those changes remains to be seen. Ultimately, it’s not a problem of the mind; it’s a problem of the will. Whose will is it that keeps us going the way we are? The will of capital, albeit a capital that’s been refurbished for our modern times. That will cloaks itself in the garb of progress, science and technology. At the same time, it justifies itself by the invocation, in the developed countries and those (like China) on the fast track to development, of an apparently all but incontrovertible need to maintain “our way of life.” That way of life threatens to fairly quickly become a threat to the possibility of life in any form that we would want to be part of. But this is no argument that the real cause of environmental degradation lies with the individuals who drive cars or chill their homes. There is a great deal of what we have become accustomed to that will have to be reconsidered and there is a great deal to be gained by individuals and various communities experimenting with new ways of living now that could serve as potentially valuable models for what we might decide to do. But the root cause of the degradation lies with the on-going transformation of human labor power into a hostile power that increasingly dominates all aspects of human life. 1. BP is not alone in its efforts to double-cross. Mitsui (a Japan-based multi-national company), which owned a stake in the well, has refused to pay BP $480 million for its share of the costs incurred in the effort to stop the spill and clean up the Gulf. 3. See [url=See Slow Violence and the BP Coverups. ]Slow Violence and the BP Coverups[/url]. 4. Lee Raymond, Chairman and CEO, ExxonMobil, February 2003, quoted in Crude World, p. 119. 5. Much has been made of the lack of powerful oversight by the government as a result of the cozy relationship between the oil companies and the leadership and staff of the Minerals Management Service, especially in the Gulf. That is undoubtedly true. 6. See Evidence Mounts of BP Spraying Toxic Dispersants for details. 7. See Slow Violence and the BP Coverups. 8. See The BP Oil Spill: Keystone Kop Kleanup? 9. See Joye’s blog at Focusing in on oil. 10. Murdering the dead: Amadeo Bordiga on capitalism and other disasters – Antagonism. 11. Andrew Ure was a doctor, a chemist, an author and an apologist for large-scale industry. Marx frequently made use of his work but was very critical of his views. Justus von Liebig, was a chemist, from whom Marx apparently borrowed the concept of metabolism.